The Queen was joined by one of her closest family members on Tuesday when she hosted a reception at Windsor Castle for more than 200 volunteers. 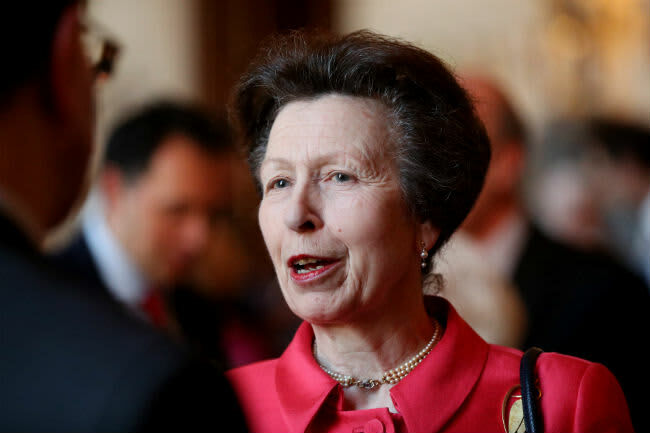 Her Majesty’s daughter Princess Anne was in attendance, as were the Duke and Duchess of Gloucester. The royals chatted to guests at the celebratory event, which marked the 100th anniversary of the National Council for Voluntary Organisations (NCVO), of which the Queen is a patron. The event was held in St George’s Hall, where guests were reminded of one very special royal event last year – with Princess Eugenie‘s wedding outfits on display as part of the current royal wedding exhibition. Among those in attendance was NCVO chief executive Sir Stuart Etherington, who enjoyed reminiscing with the Queen about her 90th birthday. He said: “The royal family have been our patron for 100 years and that’s very important to us. We represent charities in Britain and the Queen has always been involved in charitable activity. This endorsement is massive for us and very important, it’s a wonderful thing she’s done.” He added: “We were talking a little bit about the patron’s lunch on The Mall for her 90th, which I chaired. We remember that day with great affection to celebrate her involvement in charitable activity.” The NCVO has helped to establish independent charities including Age UK, Citizens Advice and the Youth Hostels Association. Windsor has been the hub of many royal events over the past year in particular, with two royal weddings, and a soon to be royal move – with the Duke and Duchess of Sussex set to move to Frogmore Cottage in the next few weeks ahead of the birth of their first baby. Frogmore Cottage has since been undergoing extensive renovation works that have been overseen by the couple, including having a £50,000 green energy unit installed, and reportedly creating an eco-friendly nursery for their firstborn. Kensington Palace have said that the costs of building work will be covered by the Sovereign Grant, while Harry and Meghan are expected to pay for any decorative updates. Similar levels of secrecy surrounded plans for Anmer Hall on the Sandringham Estate, which was given to Prince William and Kate by the Queen following their wedding in 2011.